But really, if you suffer from smelly foot odor, let's talk about it in the open. Something to think about and some questions while we discuss together. What kind of soap are you using? Is your current foot soap both antiseptic and anti-fungal? Do you understand how it works to fight odor? Does it provide natural, holistic foot cleansing qualities? 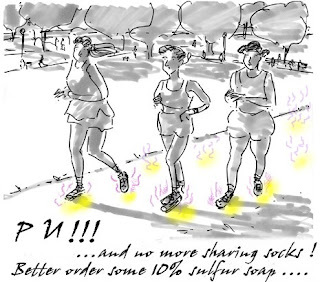 Do the anti-bacteria and anti-fungal active elements in the soap stay within your foot skin mantle and your socks, shoes, or sandals? In other words, have you really given thought to the type of foot soap you are using? And are you washing with this foot soap regularly? Here's a foot wash regimen to help keep your feet clean. This is only a foot wash, and not a medical procedure. If you have an allergy or sensitivity to sulphur, contact your doctor first for advice. Also, if you have any medical concerns, discuss with your medical professional. The following is not medical advice, but just a suggested washing method to wash the feet. 1. Try our 10% sulfur soap - www.SulfurSoap.com- our original 10% sulfur soap is packed with micro flowers of sulfur fine mesh particulates. It's a great choice. 2. Get a nice warm foot bath going, and apply the sulfur soap directly to your feet. Don't use a plastic loofah. But instead, lather up the soap with your hand and directly upon your foot. Can't reach so easily? Sure, if you have a loved one, family member or good friend who can do it for you, then that's great. If not, then make a go of it, and do the best you can. Lather it up best you can. 3. Leave the sulfur soap lather on your feet for as long as possible, at least a couple of minutes. Then soak in the water. 5. The first couple of applications, try to pat dry your feet with the sulfur soap lather still on the feet. Don't rinse. Just pat dry with a wet towel. If for any reason, your skin breaks out or has some reaction to the sulfur, discontinue use and contact your physician. This may indicate you have an allergy or sensitivity to sulfur. Keep up this regimen. Email us and tell us the results! Or post comments below. Last newsletter, Pat kept us updated on soap plant investments. He spoke right to heart about our daily mission here at SulfurSoap.com. Here's a link to the last newsletter in case you missed it - please click here. This month we'd thought we'd go down memory lane to a newsletter I wrote about 10 years ago about a very special skin care condition. Since that time, we have received many hundreds of thankful emails from all over the world. This is something that truly goes straight to our heart here at SulfurSoap.com when we get to help others. The skin condition is often referred to as "Smelly Scalp". After publishing our newsletter, we carry its archive at www.SmellyScalp.com Back then, we wrote monthly newsletters on all sorts of topics. This is something we'll do our best to bring back ( hint - our latest New Year's Resolution!). But I must say, please send in your ideas and suggestions for upcoming newsletters so we help with the type of good information you're looking for! And as always, we'd love to share your experience if you say it's OK. Anyway, Smelly Scalp affects mostly middle aged females, especially those of us going through 'the change' of menopause. At the hairdresser, that comb or brush can transmit all sorts of things, like bacteria and fungus. And in the case of hair odor from the smelly scalp condition, it is indeed fungus that is the culprit. To post a comment, you can click here and go to bottom of page.